Accessories: Accompanied by Patek Philippe Extract from the Archives confirming production of the present watch in 1964 with silvered dial plate, lapped indexes in gilt brass and its subsequent sale on October 16, 1965. In 1948, Patek Philippe inaugurated its Electronic Division, with the goal of innovating photoelectric and electronic timekeeping technology. 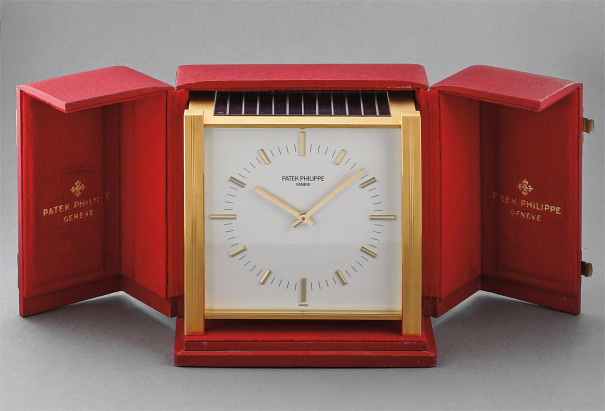 In 1955, the firm showcased a solar-powered photoelectric clock at the World Symposium. Fresh to the auction market, the present clock from 1963 merges state-of-the-art technology from the 1960s with the best of mechanical watchmaking. A large solar panel on the top of the case supplies energy to a storage device within which in turn transmits energy to power the movement. A battery system is also provided for back up, further illustrating how intelligent and ahead of its time this clock was. This clock, in overall excellent condition, successfully displays great technical innovation and futuristic timeless design, and would be a great addition to enhance any interior. It is furthermore accompanied by its original fitted presentation box.